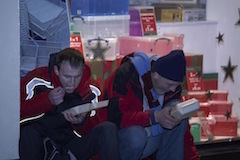 Each night in London, hundreds of people are sleeping on the streets. They are cold, hungry and vulnerable. 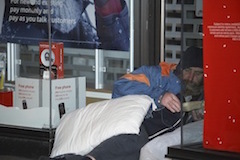 We believe in making a difference to the lives of those sleeping rough. Each week our volunteers prepare up to 200 hot meals, fresh fruit and hot drinks. 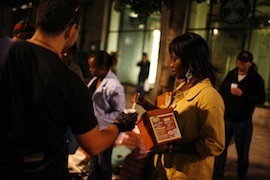 These are served on the street to whoever needs a hot meal; many may not have had a hot meal for quite a while. We believe in showing the love of God through provision to those in need and that every person needs sustenance for both body and soul. As Christians we believe in sharing the gospel; but we also believe that giving must be unconditional if it is to be motivated by love. We don't require anyone to share our beliefs, and we don't ask why a person is in need. 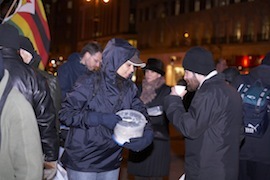 Our aim is to provide for all in need on our streets, regardless of the cause of their need, to people of any faith or none, and regardless of their backgrounds. We minister by providing good food and (if desired) by prayer for healing, for release from addiction and other adverse circumstances, or simply by providing a sympathetic ear to those who society has cast out. Fast 58 is a registered charity set up by a group of Christian volunteers with a commitment to street based outreach and ministry to the poor and needy in London. Find out more about our inspiration and history. Every Friday night, volunteers from Fast 58 cook up to 200 hot meals and prepare bags of fresh fruit and flasks of tea and coffee to be served to those sleeping on the street. Preparation of the food begins early on Friday afternoon, cooking and boxing up the hot meals, preparing the fruit and hot drinks. Before going out onto the street, volunteers spend time in group prayer. We then head out onto the street, to Strand and Waterloo. Our team then shares the food and drinks and provides a listening ear and a word of encouragement. Though we are careful not to seek to compel vulnerable people into accepting our message, many people have come to Christ during these outreaches and many seek encouragement and prayer to help in a time of need. Our outreach is usually concluded by a time of worship on the street, joined by rough sleepers, other churches with a heart for the homeless, and even by passers-by. As a volunteer organisation with a very modest budget, we always welcome help from volunteers who share our concern for the homeless. You can help with food preparation, transport, food distribution and ministry on our Friday outreach. Even if you cannot help by volunteering your time, a donation towards the cost of providing food would help to ensure that we are able to continue to provide nourishing meal to those in real need. Links to homeless charities, homeless person units, and day centres.